Phoenix Precision, based in Elk River, MN, crafts precision target sights for long range target shooters. Known for their outstanding reliability and repeatability, Phoenix rear sights are gaining popularity among competitors in prone, Palma, and High Power disciplines. Some of the top “sling and irons” shooters in the country have switched to Phoenix sights. Share the post "Phoenix Rear Sights Impress Match Shooters"
This week’s episode of Shooting USA television covers END of TRAIL, the World Championship of Cowboy Action Shooting. 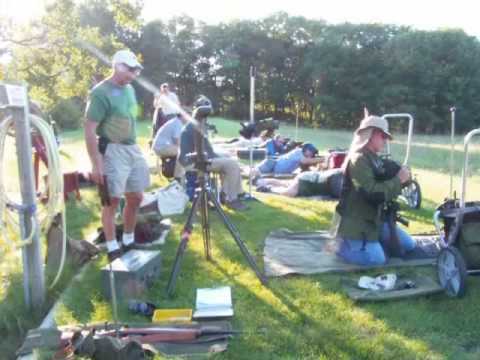 Based on the number of shooters, End of Trail is the second largest rifle/pistol competition in North America, topped only by the NRA National Championships at Camp Perry, OH. In 2009, over 1000 shooters from a dozen countries competed at the 28th Annual END of TRAIL World Championship of Cowboy Action Shooting and Wild West Jubilee produced by the Single Action Shooting Society (SASS). End of Trail is held at Founders Ranch, located near Albuquerque, NM. Along with the 1000+ competitors, END of TRAIL attracts thousands of spectactors with Wild West-themed exhibits and entertainment, including mounted shooting from horseback. Visitors can sample wares from hundreds of vendors or enjoy “living history” Wild West encampments spread over 50 acres. Share the post "ShootingUSA Covers Cowboy Action World Championship"
Cabelas.com is currently running a Bargain Cave Labor Day Sale. Select items are discounted by as much as 70%. You’ll find great deals on everything from snap-caps to large, base-camp style wall tents. Here are a few of the bargains we found…. Regularly $29.99, these 100% cotton BDU trousers are on sale right now for just $14.88. That’s a great deal for rugged pants that can be used for shooting, hunting, or general outdoor use. These rings fit the integral dovetails on the top of CZ actions. They may fit other rifles with rails or dovetails with similar dimensions. Normally priced at $54.99, these rings are now offered for just $19.88. That’s a steal for quality rings. NOTE: Warne says “no lapping” is required, but you may want to lap the rings to reduce the chance of marring an expensive scope. This hunting parka, regularly priced at $174.99, has been very highly reviewed by Cabela’s customers. Now the price has been slashed way down to $69.88! Waterproof, yet breathable, the parka features 150-gram Thinsulate insulation and a quiet, low-nap shell that won’t collect burs. Large cargo pockets have shell loops inside and handwarmers behind, and the hood is removeable. CLICK Here for Buyer’s Reviews of Seclusion Blaze Parka. Share the post "Cabela's Labor Day Sale Bargains"